The wait may have seemed like an eternity for RPG fans, but Square's Chrono Trigger, considered by many gamers to be one of the finest role-playing offerings in video game history, has finally arrived on Nintendo's Virtual Console service. The world can now start spinning again. Gabrielle's Ghostly Groove: Monster Mix (Natsume, 500pts) — Wii owners can pick up their Wii Remotes and get their groove on with a unique dancing version of the upcoming 3DS retail release. We'll have a full review of the game coming up shortly to let you know if the game has all the right moves. Lead the Meerkats Demo Version (Lapland Studio, Free) — A demo version of the WiiWare release that allows you to take control of a lonely Meerkat who's been separated from his pack and must now put together and lead his own pack. You can check out our Lead the Meerkats review to find out our thoughts on the full release. Big Bass Arcade (Big John Games, 500pts) — Catch as many fish as possible using a wide variety of areas to fish, not to mention different lures. We'll have a full review coming soon. Word Searcher 3 (Digital Leisure Inc, 500pts) — This puzzler will test your memory and problem-solving skills with over 100 unique puzzles. Our review will be available soon. Hellokids - Vol. 1: Coloring and Painting (BiP Media, 200pts) --Create your own unique drawings and then color and paint them in or just color in one of the 150 included drawings. This came out in Europe last month so you can read our Hellokids - Vol. 1: Coloring and Painting review here. 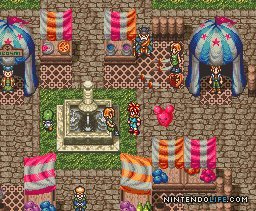 Chrono Trigger (Square-Enix, 800pts) - One of the most respected RPGs in history finally makes its appearance on the Virtual Console and not a moment too soon, really. Our full review should be following shortly. Ready to switch up your routine - or even your century? With the arrival of the Super NES™ favorite CHRONO TRIGGER® on the Virtual Console™ service, Wii™ owners can liven up their living rooms with a classic time-twisting adventure. For the Nintendo DSiWare™ service, Big Bass Arcade invites players to cast away boredom by casting a line in search of mighty fish, while Word Searcher 3 offers fresh puzzle-solving challenges that can be enjoyed anywhere. Gabrielle's Ghostly Groove: Monster Mix for the WiiWare™ service sets monster-themed fun to an irresistible beat. Delightful deviation from the norm is just a download away. Description: A young man is transported into the past, altering the course of history and the outcome of the future. He has to find his way home, but first he must travel to the outer edges of time to repair the world's chronology. On the way, he encounters strange friends and foes, uses incredible devices and vehicles, and penetrates and neutralizes the fortresses of the past, present and future. A paradox has been created. If he does not restore the order of time, nothing will ever be the same. He is the one who will become a hero. He is Crono. Description: Big Bass Arcade is all about the action where the bass are biting and fighting. Catch a boatload of fish and take a shot at the world-record bass. The game is packed with features: seven different lakes, nine lures, three multiple-lake tournaments, 42 events, high scores for each event and the elusive world-record bass. Big John Games brings 17 years of fishing game experience to Big Bass Arcade to create incredible fish behaviors, spectacular animations and second-to-none fish AI. Putting the fun back into hand-held fishing is the name of the game. Players choose from two control options - stylus or +Control Pad - for casting, reeling and controlling the fish-fighting action. Big Bass Arcade appeals to fishing enthusiasts and gamers alike by capturing the adrenaline rush of fish-fighting in an arcade-style game. Description: You'll need a keen eye and a quick mind to complete 100 themed word-search puzzles. Word Searcher 3 contains fun words from multiple categories including astronomy, currency and rivers. Packed with a huge assortment of subjects to choose from, there's sure to be a puzzle anyone can enjoy. Keep your vocabulary, memory and problem-solving skills sharp with these challenging puzzles. Keep track of - and try to beat - your own play-through times again and again as words are scrambled every time you play. Description: Imagine a coloring book on your Nintendo DSi™ system, add the ability to create your own drawings and to draw over photos, and you've got Hellokids. Color and draw using the Nintendo DSi stylus. Enjoy more than 150 drawings you can color with three difficulty levels, including a "color containment" assistant. A Freehand Drawing mode includes simple, practical tools, such as an automatic fill function, a color palette and decorations. You can also draw on a photo you've taken or uploaded from your Nintendo DSi album. Hellokids is a great pocket companion for all budding artists. Description: Join Gabrielle and her monster friends as they dance along to a spooktacular selection of songs. Grab your Wii Remote™ controller and dance along as you shimmy, shake and spin in time to the music. There's trouble in Monster Town: Vlad the Vampire's loyal zombies have disappeared. Gabrielle and her monster friends will have to bust some serious moves on the dance floor in order to lure them back. Along the way, maybe they can uncover the identity of the mysterious creature that's terrorizing Monster Town's zombies. Up to four players can show off their best moves in the game's multiplayer mode. (Additional accessories are required for multiplayer mode and are sold separately.) Short and full versions of songs let you dance as much as you want. Unlock tons of outrageous outfits and items. Description: In Lead the Meerkats, you are a young meerkat who has a lot to accomplish. You've been separated from your pack, and the time has come for you to form your own meerkat pack. Are you ready for the challenge? Name your pack and its meerkats. Dig burrow networks and enlarge your territory. Forage for food and grow your pack size. Stay on guard and be ready to make quick decisions. Run to the safety of the burrows or fight your enemies. Go head-to-head with a rival meerkat pack. Lead your pack to victory and rule the savanna. Lead the Meerkats is the first game to simulate the exciting life of meerkats. Lead your pack and enjoy the company of these lively and endearing animals. Lead the Meerkats offers fun game play for animal lovers of all ages. Not much for me, although I might check out Big Bass Arcade if it gets a good review. I'm definitely getting Chrono Trigger. $8 via VC vs. $50 for the cart? You can't go wrong with that! Already have the DS version, but nice for those who don't. /me puts thinking cap on. I'll get Chrono Trigger sometime. Playing Mortal Kombat to death currently. MDK2 last week, Chrono Trigger this week. I'm just waiting for a late 90s version of Elle McPherson to knock on my door next Monday, then I'll have to mail my Genie a thank you card for a job well done. Just passed Chrono Trigger on my Wii yesterday Gotta love that one. I've paid for it too many times to pay again though. I'm going to DL "Lead the Meerkats" bc/ it will probably be quicker than reading that looooong review Probably no game that got a "6" is going to be worth $10 to me though, especially not when LoZ:TP is $20. Chrono Trigger? Never heard of it is it any good? Will be picking up Chrono Trigger and the Meerkats demo immediately. Is the DS version of Chrono Trigger notably better/ worse than the original? My local games store is selling it for cheap, only about twice the price it'll cost me to download, and I've always preferred having physical copies of games. Which should I go for? Looks like Chrono Trigger saved what would otherwise have been a pretty lame update. There isn't much of a difference between the two. The DS version does have added content, but it's not very good. Other than that, they're the same games. Just go with whatever version you feel like. It's one of the most respected RPGs in history for a very good reason. I have been waiting for this for a decade! I had the SNES version but had to leave it with my parents when I moved out since I "co-owned" it with my brother. Chrono Trigger .....An all time great. Ghostly Groove actually may be worth a download tbh. @pixelman: Squenix has stated before that the decision to make a new Chrono game depends upon sales of the previous titles. People really dropped the ball on the DS release, so I'd advise helping out with the VC one. Think of it as an investment in the future. Especially considering Squenix has been having financial trouble as of late...they need your $8! @Ryno: Never heard of...dude, you need to download this STAT! @Homer_Simpson: The DS version includes the Anime cutscenes, bestiary, music test, and equipment list features from the PS1 release, as well as all-new dungeons and an improved, uncensored translation. I would recommend the DS version, naturally. That said, there's nothing wrong with people going for the VC version if they want. Just so long as they're going for it at all. Great game, everyone should buy it in some form. The PS1 version should be coming to PSN pretty soon (once they get the store back online, of course) as well. I'll probably download that and this, bringing my collection of copies to all five versions! @Stuffgamer1: Well, I ended up buying it the minute it came out, so I've done my bit! lol. Not regretting it one bit either. This game is so much more fun on the big screen. Get it, get it, get it, get it. Played it before on the DS, but got bored of it after a while and figured I'll just wait on this version, lol. JRPG lovers, enjoy if you haven't done so already. Chrono Trigger people! Effing Chrono Trigger. He said cart not card. Ok Square-Enix, if you need my money so bad, release FFIII in the US!!!!!! That's a guaranteed $16 right there, and I'm poor! Chrono Trigger, welcome to the Virtual Console! Eh, I just bought MDK2 so no more Wii Shop downloads for me. I just immediately bought it and played it for 2 hours. What a great, great game. Gabrielle's Ghostly Groove: Monster Mix for 500 points? I expected it to cost 1000 points. This is good news. Whoa! Chrono Trigger?! Seriously??? I'll download it when I get some points later. It's not going anywhere. I was so close to finishing the DS version when my DS Lite prematurely bit the dust. With Chrono Trigger in the list, it makes every other game look like garbage. Some people who own the DS version will probably pass this up, but I think it's worth a measly 8 bucks to play the game on your TV instead. I wonder how well the original translation holds up, I find Final Fantasy 3's to be pretty awful. ^So I'm not the only one who hates FF3/6's original translation. The GBA version is much better in that regard, IMO. @Mickeymac The GBA translation of FF6 makes me cringe. It's especially bad at the Opera House. Skip ahead to 7:20. I could not afford the SNES cartridge, now is my chance to play the original staff (even in DL). This game was my first JRPG and is the best gaming experience along with Zelda, Fzero, Mario 3, Metroid Prime in another genres. Great Music, good story even for today standarts, Good character development, multiple endings, ... and epic feeling in every corner. ...What was there to cringe to? Looked fine to me. @Mickeymac Where he used to say, "I once abandoned someone when she needed me." On the GBA he says, "I'm tired of standing by and doing nothing while I lose the girls I like." Come on! No one talks like that. Actually I take that back, Chrono Trigger is my favorite game of all time! Chrono Trigger came out, you could have just stopped the list at that and not listed anything else. @Banana_Jane: So he did. It just boggles my mind that anyone would even CONSIDER buying an overpriced SNES cart when the much cheaper and arguably better DS card is readily available, though. Good looking slate this week. Can't go wrong with Chrono Trigger, and I think Ghostly Groove is going to surprise some people. I played this game for 10 hours yesterday to celebrate--on my DS. Seriously, they would have gotten A LOT more downloads from people by releasing this game years ago on the VC before a superior portable version came out. Chrono Trigger? Pass... JUST KIDDING! @PSICoffee: But that's actually exactly why they DIDN'T release this before the retail game...they wanted to make the money on the $40 retail release first. You know plenty of people would've skipped the DS version if the game was already on VC. Too many people skipped it even though it wasn't as it was! Well after sitting near my TV for the past 16 years my cartridge of Chrono Trigger is finally resting in storage. Truly one of the greatest games of all time. Now I just need to get the DS version.